Finding a good vertical broiler for home use is hard. While restaurants use commercial versions of these specialty cookers to produce delicious gyros, shawarma, kebabs, and more, it’s tough to find a machine that’s scaled down enough to be affordable for household kitchens. Making 30 lbs of gyro at once might be delicious and inexpensive on a macro scale, but I don’t know very many homes that can really make use of this killer capacity. So what’s a home chef to do? In this article, I’ll outline your options for making rotisserie meats at home. While not all of these machines are true vertical broilers, they’ll all be wonderful when it comes to roasting meat from all sides. I’ve chosen options that range from beefy commercial units to smaller countertop roasters that can easily fit in your kitchen while fitting inside of your budget. This way, you’ll be able to choose a machine that works for you. You might think that electric broilers are cheaper than their gas-powered counterparts. When it comes to commercial-sized broilers, this is very much not the case. Electric broilers have powerful heating elements and robust circuits that are necessary to handle the incredible electric power needed to roast giant slabs of meat. This makes these machines quite expensive to purchase. Theoretically, they can save you money over time, but be warned that the up-front costs can be quite high. When it comes to smaller machines, however, this isn’t necessarily the case. The Elite Cuisine ERO-2008N is a miniature roaster that’s essentially powerful toaster oven with a rotisserie rack on the inside. You definitely can’t put a 30 lb piece of lamb in this unit, but it’s quite affordable and will let you make a gyros or kebabs for your family and your guests with ease. The inside of this oven measures 12” x 13” x 8.5.” This is plenty of space for a medium chicken, several pounds of beef or lamb, or six slices of bread. The oven boasts two heating elements, one on the top and one on the bottom, and has an adjustable temperature of up to 450 degrees. The rotisserie kit includes both skewers, to keep your food in place and rotate it automatically as it cooks, and tongs, to help you remove things when they’re done cooking. Broilers of all sorts, including your favorite vertical kebab grill, can reach some pretty high temperatures. This electric rotisserie broiler might seem a bit stunted in that department. 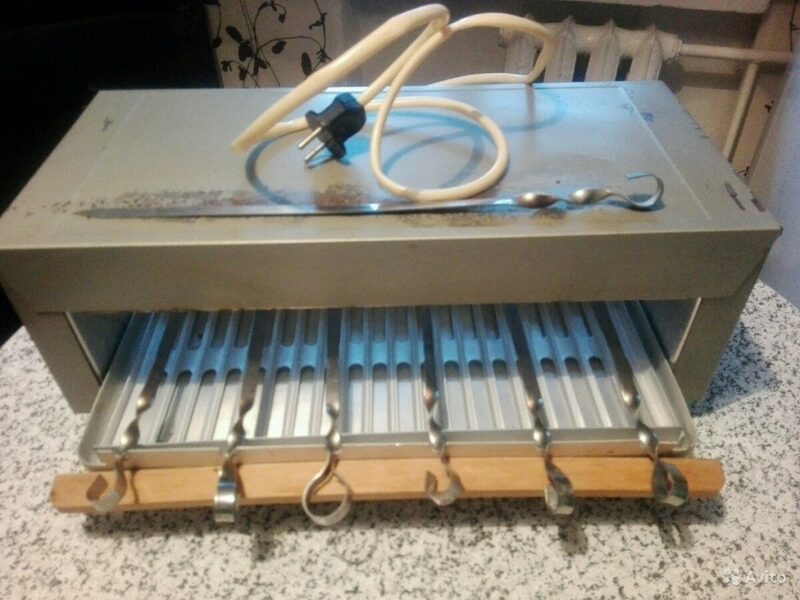 Luckily, the internal heating elements are more than powerful enough for most kebab, shawarma, and gyro recipes. Meat only has to reach an internal temperature of 165 or so to be fully cooked. This 450 F capable toaster will more than do the job. The most common customer complaint associated with this oven is not related to the functionality – this durable, effective countertop oven earns lots of praise. What people do complain about is the lack of instructions. Setting up the rotisserie functionality of this oven can be a bit of a pain if you’re not sure what you’re doing. In this age of information, it’s a good idea to look up a video or two to see what kind of tips the internet has to offer. 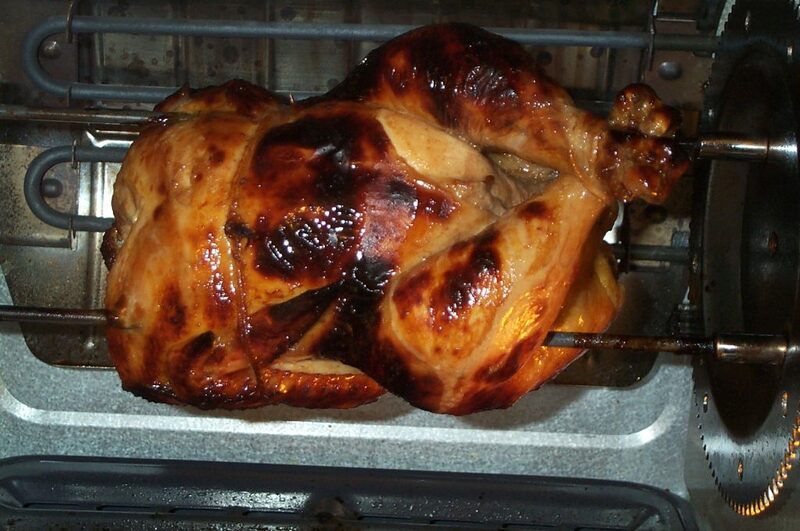 So, how does it compare to a vertical broiler? The big advantages of vertical cooking mostly stem from how rendered fat drips down your meat. Something pretty similar happens when you employ traditional horizontal rotisserie cooking. This isn’t to say that this machine is identical to a commercial gyro turner, but rather that the meat it produces is just as delicious, tender, and juicy. The big differences come from how easy it is to cut food off of the skewer while it rotates. You can certainly trim a loaf of gyro while it cooks in this broiler, but it’s definitely not as easy as it is with a vertical machine. Overall, I can’t recommend this Elite Cuisine Rotisserie Countertop Oven enough. It’s small, affordable, and packed with lots of functionality. You’ll find yourself using it for everything from pizza to kebabs to chicken to toast. A slide-out bottom tray makes cleanup a breeze, while the sturdy design ensures that this toaster will stick around. One thing to note: you can get a slightly pricier version of this oven with a convection fan. If you’re willing to spring for it, that unit is even better. The addition of a fan helps keep temperatures high and even while you cook, which tends to reduce cook times and tends to help your food come out even better. I think it’s definitely worth a few dollars to upgrade to the convection model of this unit, even if you’re planning to use it mostly for kebabs. If you’re willing to spend a little bit more, the Flexzion Rotisserie is a brilliant option. Less versatile than the Elite Cuisine toaster above, it’s a very similar unit. The Flexzion has been tilted on its side, allowing your gyro and shawarma to sit vertically. As far as advantages go, the big ones have to do with your access to food. The Flexzion has a big, clear door that allows you to easily carve strips of gyro without having to turn anything off. You can also impale seasonings at the top of your meat log and fit up to 7 included kebab skewers to cook lots of kebabs at once. As far as performance goes, however, there’s not a gigantic difference between the horizontal Elite Cuisine and this vertical Flexzion. 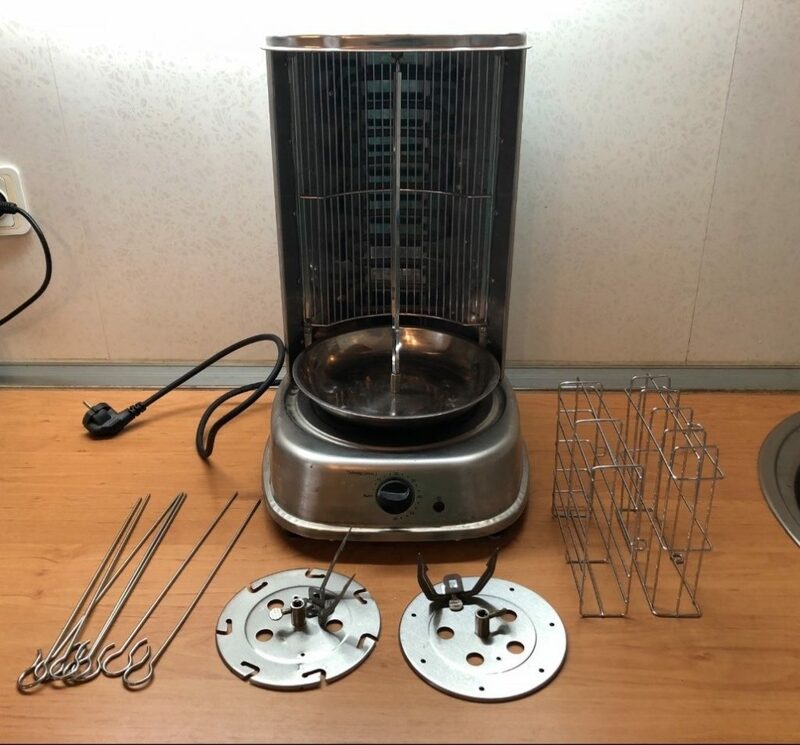 The adjustable heating element is powerful enough to cook gyro in under two hours, while the automatic rotation ensures that cooking is as close to hands free as it can get. You’ll definitely love the food you cook in this electric vertical broiler. The rotated form factor is certainly better for a limited range of specialty foods, but I think I’d find myself missing the other functionality from my toaster oven. 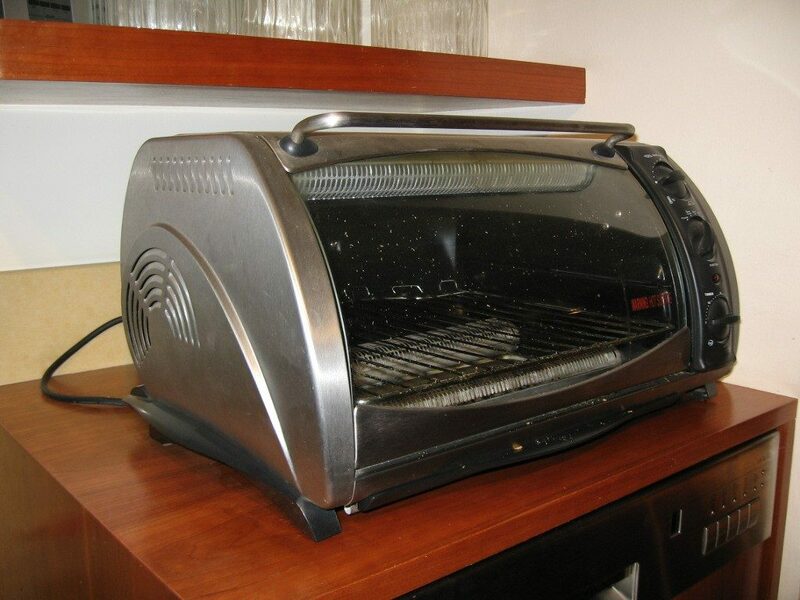 If you already have a nice toaster oven, this Flexzion is a great option. Otherwise, unless you’re a die-hard shawarma fan, I’d suggest choosing the Elite Cuisine instead. This small electric vertical broiler is perfect for smaller restaurants, specialty shops, and serious Mediterranean food enthusiasts. While it’s significantly pricier than the horizontal rotisserie oven above, it’s one of the smallest and cheapest machines that actually allows full vertical broiling. This machine has a powerful heating element that’s designed to cook up to 12 pounds of meat at once on its automatic spinning shaft. To be clear, this unit is definitely on the small side as far as commercial broilers go. It weighs in at about 25 lbs and takes up a somewhat smallish amount of counter space. While the 12 pounds of maximum capacity it offers might seem like a lot, you might find that it’s a lot less meat than you think. At 1/3 of a lb of meat per gyro wrap, that’s only a few more than 30 wraps before you have to put in another log of meat. The functionality of this unit is near flawless. The heating element gets to a sizzling hot temperature in a jiffy and stays right where you want it while the unit automatically rotates your meat. Since it’s a vertical broiler, you can use all sorts of neat tricks specific to gyro and shawarma meats, including putting bits of fruit at the top of your log so that the juices drizzle down as you cook. Grease naturally runs down the log, adding just the right amount of wonderful flavor before leaving the meat entirely, making the food you make with this broiler both delicious and healthy. Of course, the big downside here is the high cost of this electric vertical broiler. Even this small unit is priced quite high for a consumer device that’s not used every day. It’s easy for restaurants, cafes, and people who throw themed parties every weekend to justify. 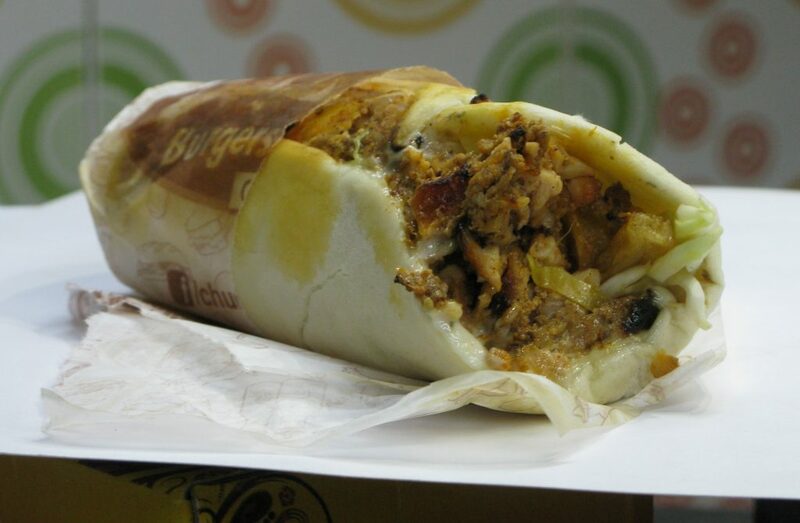 If you just want to eat shawarma a few times a month, however, you’ll probably find that this unit is too pricey. Many small business owners all around the country can attest to how effective and durable this Autodoner vertical broiler is. While it’s pretty pricey, it’s still one of the cheapest and easiest ways to enjoy meats that are actually broiled vertically at home. Since it doesn’t need gas, you can just plug it in the wall and enjoy lots of delicious broiled meat without needing to worry about turning the food. If you’re serious about gyros, you run a small café, or you have a group of people that you need to impress, this electric Autodoner is a pretty solid choice. When you’re ready to play with the big boys, this Hunslow vertical broiler offers a great mix of affordability and functionality. It’s a simple propane unit with two burners, a vertical rotisserie spit, and sturdy steel construction. Made with restaurant use in mind, it’s nevertheless one of the cheaper units you can find. The two adjustable gas burners on this Hunslow offer you lots of power. Whether you’re trying to keep your cooked gyro warm or sear the crap out of a leg of lamb, you’ll have access to the power you need. As great as the electric options above are, they can struggle when it’s time to really bring the heat. Vertical broilers like this excel at cooking food evenly, giving you a wonderful mix of texture and flavor. 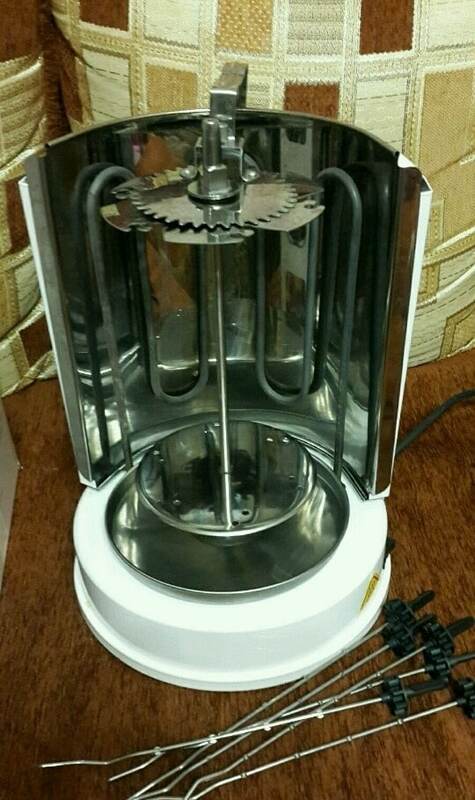 You can use all of your favorite gyro and shawarma tricks with this machine, like letting fat drop down your meat, putting seasonings at the top, or slicing meat off in layers while your log cooks. This is definitely the machine you want if you want restaurant quality gyros on a budget. That said, there are two small issues that some people have with the Hunslow. 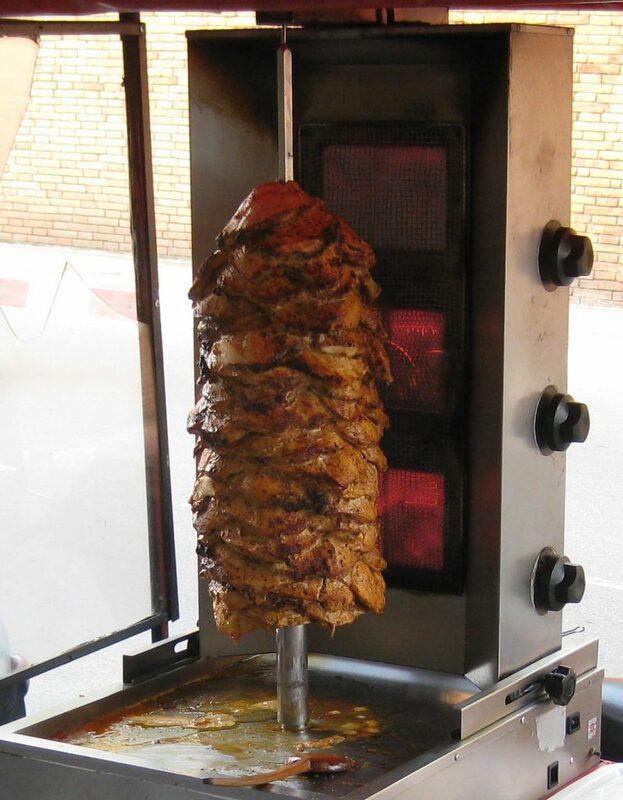 First, while the central spit rotates automatically, the kebab spits do not. 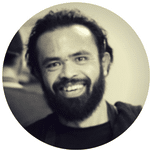 This means you’ll have to manually turn smaller kebabs if you want them to cook evenly. Second, the spit itself isn’t moveable. This isn’t the most common feature for devices like this, and it’s hardly necessary with the adjustable heating elements, but it’s something that some consumers like to have. One final note: Hunslow isn’t the biggest company, and they’ve been known to let some minor QA issues slip through their doors. Many customers report minor cosmetic damage to the outside of their units – in other words, the shiny stainless steel is somewhat scuffed or scratched. It certainly won’t impact the performance of your broiler at all. 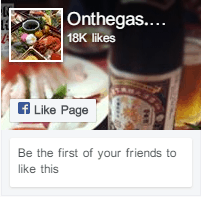 Their other common QA issue, however, involves the propane regulator. On the off chance that you can’t get your broiler to work, check the regulator first. Overall, the Hunslow is one of the best options for anyone looking for a gas-powered vertical broiler that they can afford on a home budget. It’s powerful, it’s easy to use, and it’s fairly cheap compared to larger commercial broilers. If you want incredible shawarma at home, this is probably the broiler for you. Admittedly, this fancy grill is neither gas powered nor a broiler. In fact, it doesn’t even rotate the food you stick inside! Nevertheless, it’s a unique option that merits some discussion based on just how cool it is. This cube-shaped grill is one of the most impressive things you can bring to a tailgating party or other outdoor event. It’s sturdily constructed to the careful specifications of Mike Esposito, who’s spent quite a lot of time testing and evaluating various grill designs. His latest Vertical Grill can be used to cook hamburgers, hot dogs, steaks, and more in mere minutes thanks to the ingenious advantages of his design. The grill operates on a simple principle: surround the food with heat. Completely. Mike’s Vertical Grill consists of a carefully made cube that holds hot coals up to your food from just about every side. A tray full of water gracefully catches drips and keeps the internal temperature extra high. In order to use the grill, you place your burgers, steaks, or whatever food you’d like to cook inside of a special tray. Once you’ve closed this tray around your food, you stick the tray in a slot in the grill. Hot coals cook your food from every side at once, keeping your cooking time incredibly short while ensuring that your food has a perfect seared exterior with no flipping whatsoever. Will Mike’s grill outperform a standard barbecue setup? It depends. In general, cooking food from two sides at once will be about twice as fast as cooking it from the bottom up. This doesn’t mean the food it produces is better, however, just that it can cook a burger faster. A lack of adjustable options means that Mike’s grill tends to cook at one temperature only: high. If the food you’re trying to cook benefits from a quick, omni-directional sizzle, Mike’s tends to do about as well as a conventional grill. The disadvantage of Mike’s Vertical Grill is size. 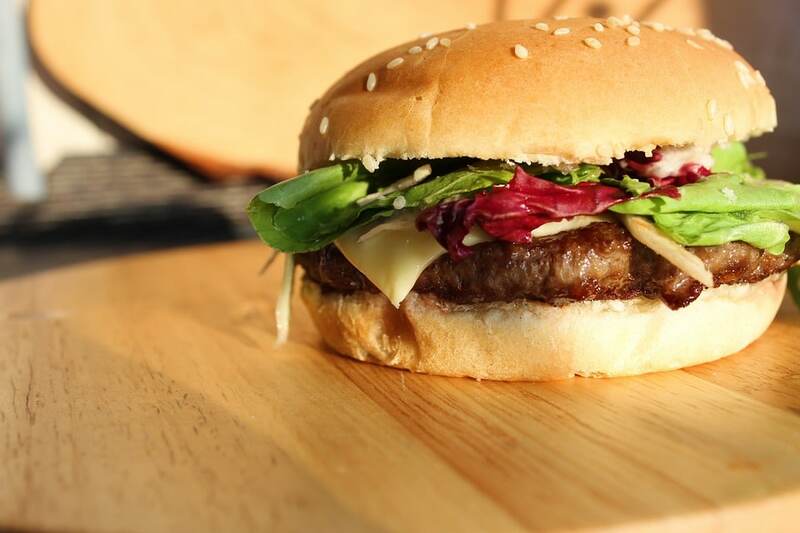 This vertical hamburger broiler might cook burgers quickly, but it can’t do very many at once. Mike’s boasts a usable cooking area of 240 square inches. This isn’t a lot of space, especially in the vertical direction. You can get some pretty thick steaks in the tray, but you definitely can’t fit in a whole chicken. Overall, this is NOT the tool you want for frequent large gatherings. It’s perfect for feeding a few friends, but you won’t want to cater a party with this grill alone. Overall, the unique design of Mike’s Vertical Grill makes it an excellent addition to the backyard of anyone who wants burgers, fast. It’s a neat conversation starter while tailgating that has the advantage of also being a darn good grill. Is it necessary? No, and the improvements it offers aren’t huge. It is, however, really cool. Gyros, shawarma, and kebabs are delicious. There’s no denying it. 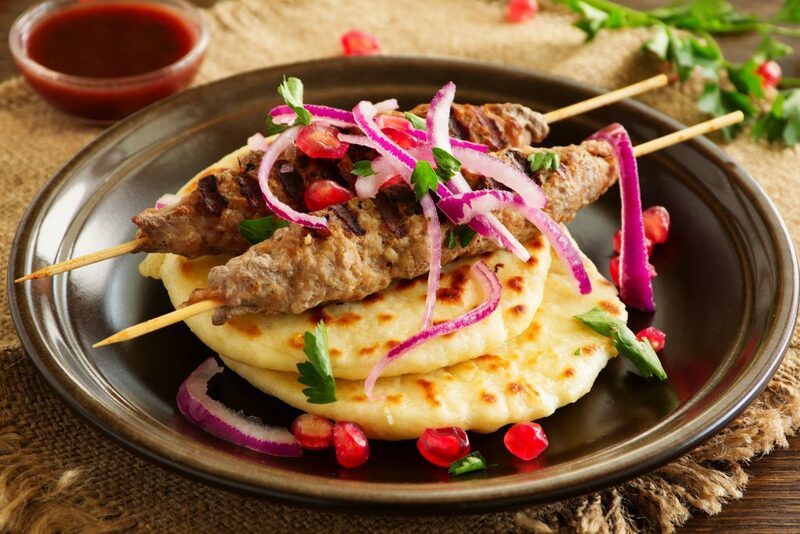 Whether you’re cooking a leg of lamb, you’re re-creating your favorite Mediterranean meats at home, or you just want to cook some kebabs, a vertical broiler can help you get the job done. The options above range from cheap electric units to commercial gas monsters that can really bring the heat. We’ve even included two oddballs, the Elite Cuisine toaster oven with rotisserie function, and Mike’s Vertical Grill, which is terrible for doner but great for burgers. No matter which option you choose, however, you’ll love the flavorful meat that you can cook on your fancy new rotisserie broiler. Best Ice Cream Cone Makers for your Cool Confections!